Sonata Music currently offers music lessons in violin, viola, piano, and voice. We teach students of all ages, so whether you would like to introduce your preschooler to the world of music or have always had an itch to learn to play and instrument yourself, we can customize a format to help you reach your goals. At Sonata Music, we believe that music is a positive experience that is uniquely able to be adapted to all people in all places of their lives. While we are not certified music therapists, we are eager to help anyone access the gift of music. If you or your child have any physical or academic challenges which are a part of how you learn, please let us know! MRI/MEG brain scans have shown that there is not one area in the brain that processes music. 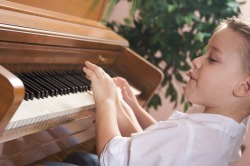 Instead, different musical elements are processed throughout the brain, meaning that music does not increase just math or language skills, but whole brain function. It has also been shown that the right-left brain connection needed to process many musical functions- using both hands in two different ways on an instrument, for example- can reduce the chances for developing Alzhiemer's by up to 80% by stengthening the synapse between the two halves of the brain. Our brains were built for music to the extent that there has never been a culture studied where evidence of music was not found. Almost every culture in the world where music has been studied has rested on the same 12 tone scale which we use in Western civilization today, or on a close derivitive of it. That is because music is a part of our psysiology, an integral part of the brain. No wonder it's said that music is the universal language! We schedule lessons on a long-term basis, meaning that teacher and student will choose a regular meeting day/time. If you need to reschedule or cancel a lesson for any reason, we require 24 hour notice. In the event that we receive less than 24 hour notice, including no-show lessons, you will be charged for your teacher's time. We will respect your time and commitment with our punctuality, and ask the same in return. If you are late to a lesson, our teachers will not teach past the scheduled time. Once you have decided that music lessons are right for you and you pick a regular meeting time, we expect payment on a month-by-month basis to be received at the first lesson of the month. 20 minute lessons are reserved for our pre-school aged and developmentally delayed students only.